I felt his strong arm around my waist as I lay in bed. I could feel his body next to mine. I had to be dreaming! Was it really him? I hesitated to turn toward him. I could feel his breath on my neck, my right cheek. I had to be dreaming! Scared to have the dream disappear….I didn’t want to turn and face him…I didn’t want to wake. I turned to look, it was him! It was Travis holding me! Tears filled my eyes as my hands touched his cheeks, his whiskers, his eye lashes, his thinning hair. I could feel him! I could smell him! Our lips met each other and we kissed. After all these days , all these months, we kissed, we hugged, we held each other while our tears joined. It was him! It was really Him! I was finally in his arms. Travis was finally home! The next memory I have was laying in our bed , awake, all alone. Tears were falling down my cheeks. It had to be real! It felt soo real! It couldn’t be a dream! It had to be real! I know that I felt his skin, I felt his lips on mine, I felt his thinning hair, I felt his arms around me. It had to be real! 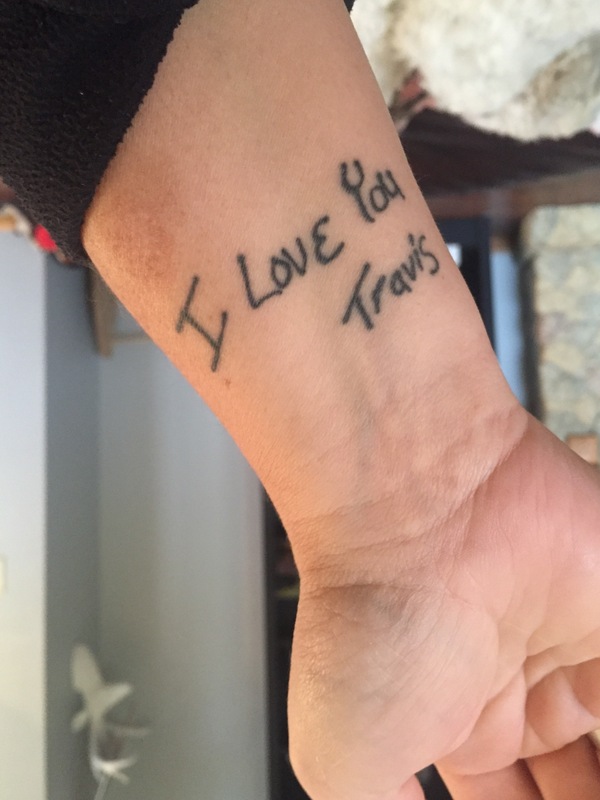 Every night I ask Travis to meet me in my dreams. I ask him to talk to me, to hold me, to kiss me , to make love to me. I ask that I wake up remembering the dream. On September 3.2016….. He answered me. It was our anniversary. Our 22nd wedding anniversary. Prior to his death, he would always give me flowers and a card, today- he gave me the most special gift. He came to me!! His gift gave me some comfort on another emotional “first”. Our first wedding anniversary apart. This is an anniversary card that I have displayed in our living room. I frequently look at it, touch his hand written words, smile knowing that we loved each other so deeply. Our love is forever. Just because he is no longer here, my love does not stop. I am his, he is mine. Our hearts – our souls are together…. Until we meet physically in heaven. Shortly after their fathers death, the girls told me they wanted a tattoo- something to symbolize their father….. 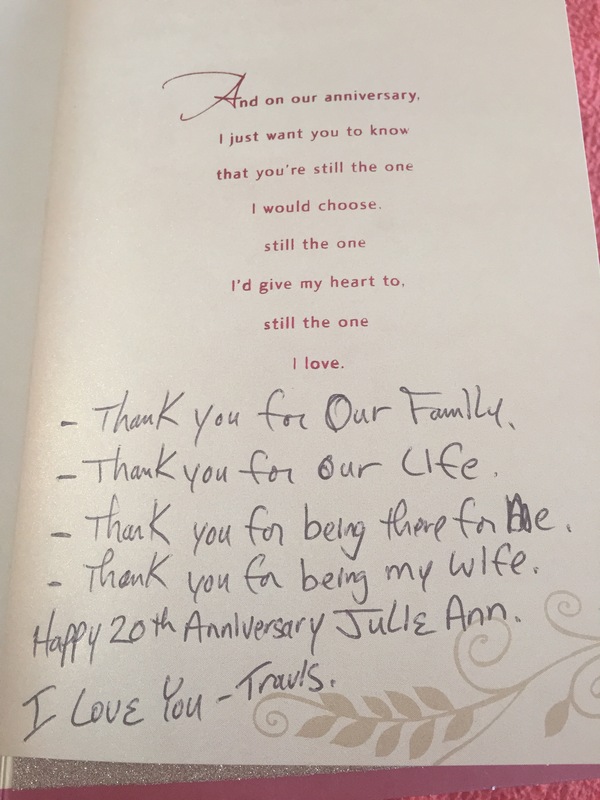 I have Travis handwriting – the handwriting from his anniversary card…. Forever on my wrist. On the same hand….I wear the ring that holds his cremains and is also engraved with the same handwritten words. I still don’t know if it was a dream or if it was real. I am so grateful to touch him- feel him- smell him- hold him- kiss him……. He was there. He was with me on our wedding anniversary. That was his gift to me.